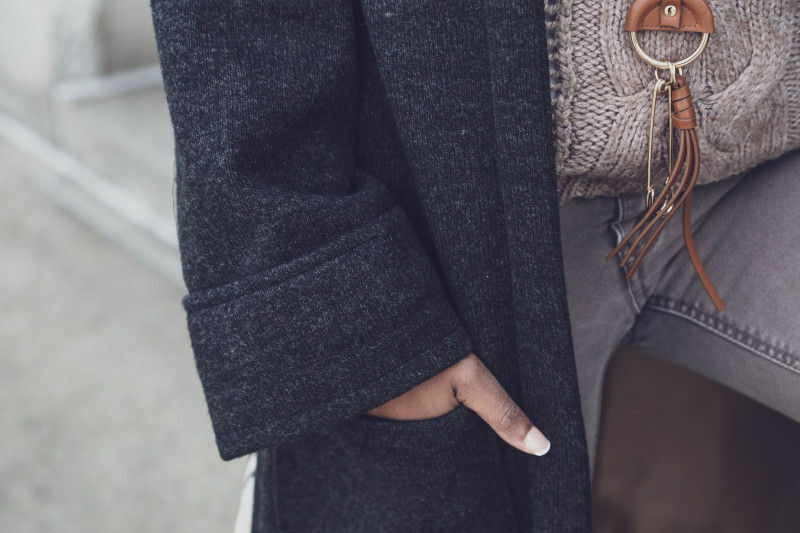 From chunky sweaters to cozy over-sized scarves, we are almost flooded with an assortment of fashionable cold weather garments and accessories. But when it comes to outerwear, we have seemed to submit to the idea of “Function Before Fashion.” Ok, yes I want to be warm, but I want to be cute too!! 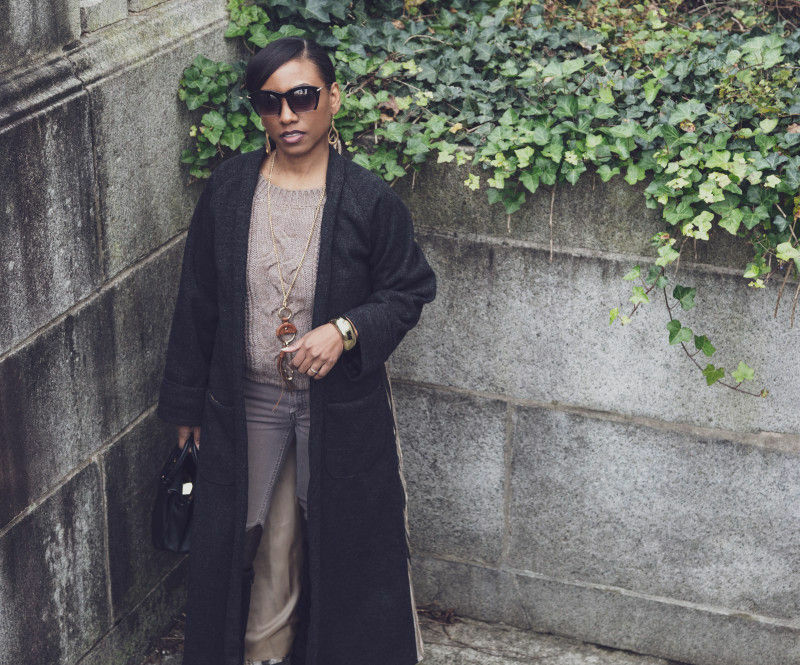 I needed a stylish, fashion-forward coat that would compliment my style without compromise. The Calla Coat Free Sewing Pattern is just that! 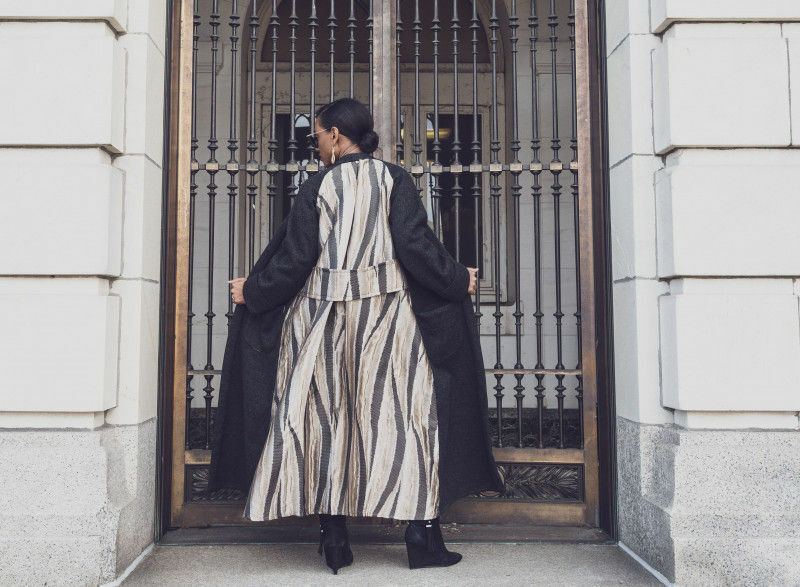 With simple lines and a stunning fabric combination, The Calla Coat offers a unique and eclectic take on Fall fashion. This pattern is perfect for fabric mixing so we’ve paired an interesting fusion of textiles using a performance wool, and a beautiful abstract brocade. Go ahead and get creative! Mood Designer Fabrics offers plenty of wool coatings that would work nicely! Try combining the look with one of their stunning brocades or jacquards. 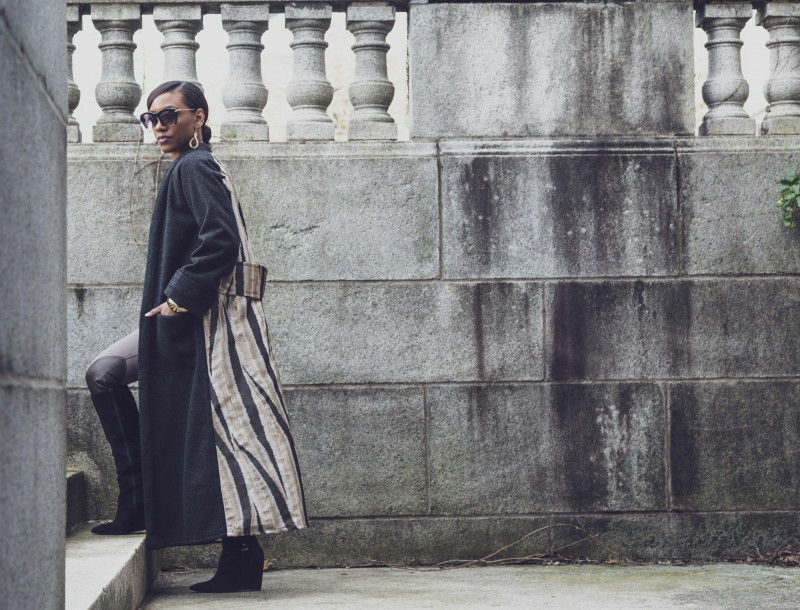 The Calla Coat is the perfect seasonal piece to compliment your winter ensemble. With large patch pockets and an over-sized faux belt, you have the best of both fashion and function! 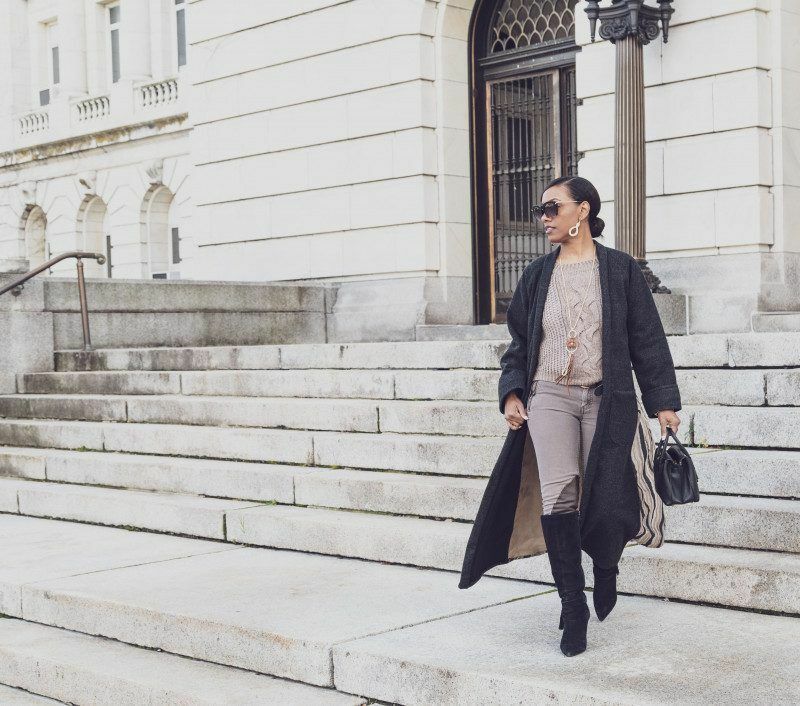 Are you imagining ways to style your Calla Coat? Let’s us know how! On the lining back, pin fabric creating the pleat and baste stitch in place. Do the same for the pleat on the back panel of your main fabric. Now pin the lining back, to your fabric back and stay stitch along the neck. Next with right sides together, we are going to pin our raglan sleeve to the front at the raglan seams and stitch. Open and press. 4. Next, we are going to work on the back belt detail. The belt is stationary so we’ll need to insert it at the side seams. 5. With right sides together, pin belt together and sew across the length of the top and bottom of the belt. Stitch, leaving it open at both ends. Trim off the excess seam allowance, and then turn and press. 6. Top stitch along the top and bottom of the belt. Place the belt across the back, and pin at side seams 5″ down underarm. 7. Now with right sides of fabric together, pin the back to the front starting at the back raglan sleeve. Stitch to the underarm mark. 8. Matching the seams underarm, pin along the length of arm, closing the raglan sleeve. 9. Continue pinning along side seams and stitch. Turn coat and press seams flat. 10. Next, let’s attach the lining to our pockets. Once pockets are lined, we can pin them in place on the front of our coats. Stitch along sides of pocket 1/8″ away from the edge. 11. With right sides of fabric together, pin cuffs along the top and bottom edge as we did with the belt and sew. Turn right-side out and press. Pin side seam of cuff together and sew. Press the seam flat and pin cuff to sleeve opening. Attach cuff and top-stitch along the edge. 12. 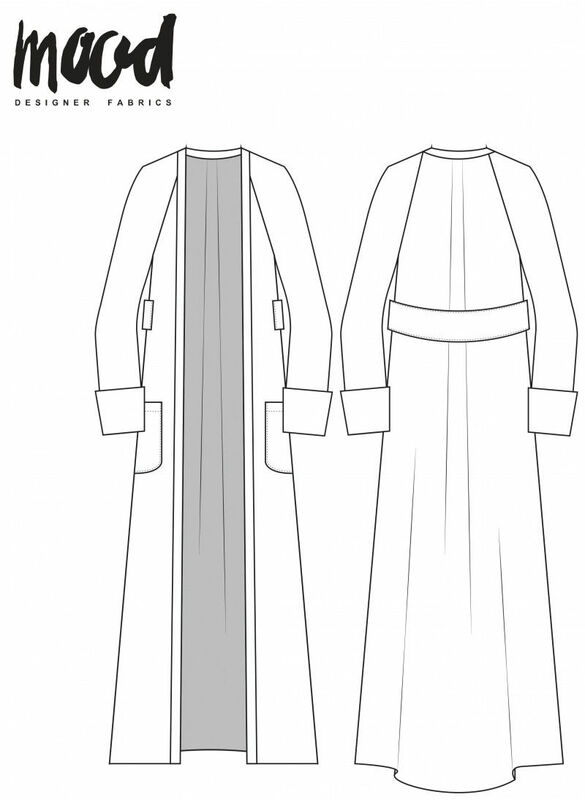 Your placket goes around the neck and along the length of the coat. The seam in the back of the neck joins both sides of the placket together. You’ll sew the right and left placket pieces at the center back seam, and then attach the second layer as the facing. Fold over facing, pin and stitch to finish. 13. As an added detail, I finished the inside of my side seams with a twill tape. Sandwich your seam allowance in between your twill tape and stitch. Now press the twill tape flat and top stitch along the edge to finish. 14. Complete by finishing your hem, and that’s it! You’re done! Those are body measurements, not garment dimensions. We have a guide for measuring yourself for sewing here! Omg this is gorgeous, I must make this! Really cute coat! Any chance you could publish actual garment measurements for any one specific size and tell us the amount of grade between sizes? It really helps to know how much ease is in the design. Thanks for the free pattern! Hello, how much yardage (60” width) would I need to make this from a single fabric?